Here is the second map of my world. It’s fairly poor quality because it’s still in pencil and my scanner isn’t great. There is one more, but that one will probably never see the light of day because it’s more of a sketch. 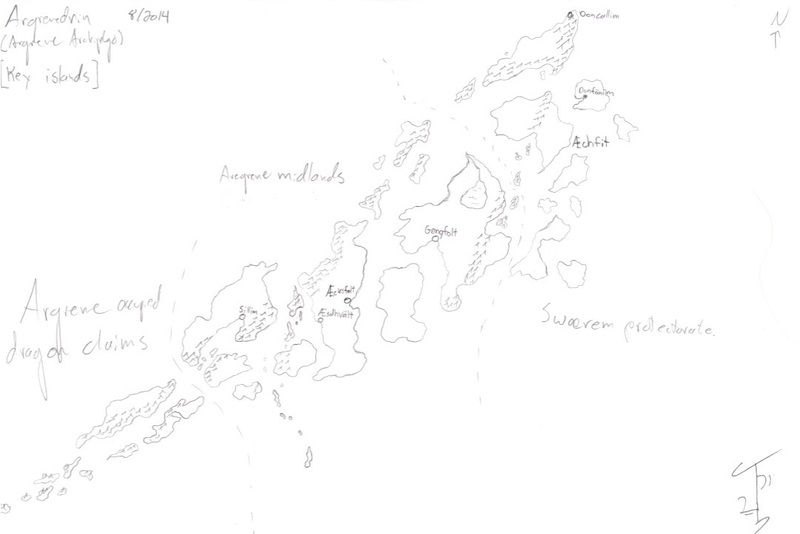 This map is of a place I’m calling the Argrene Archipelago, also known as the country of Argrenedrin. It is the main setting for the sub-plot of War of Shadows. It’s not final, and I’ve only got a few places listed on here, but I haven’t got the sub-plot all that well mapped out. What I can say is that this part of the story will deal heavily with dragons. The inspiration here comes from the Aleutian Islands of Alaska. Once I have an opportunity to revise it and make it darker, I will probably share again. This entry was posted in fantasy world building, setting, writing and tagged drawing a fantasy map, fantasy map, fantasy novel writing, fantasy world, fantasy writing. A set of islands! That should influence the story interestingly. Yes, tall ships and cannons. Unlike IGN, I love me some water. 😛 Gamer geek joke. 😐 But yes, “Voyage of the Dawn Treader”, “Treasure Island”, both excellent books, and both set on whater. I hope you do! Maps are a great way to develop a story- especially fantasy or scifi. Yeah, they really put the setting into a concrete perspective for me. Of course the trouble is that I start geeking out pretty bad on maps, though I have a geologist friend who will undoubtedly insist on review and commentary of certain features. She geeks out on this stuff way more than I do.